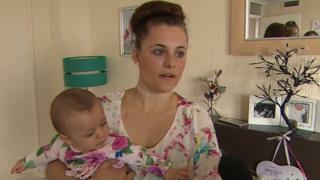 A young mother says she has nightmares about "burning to death" with her baby after work on three tower blocks was delayed. The Plymouth towers will have cladding removed after it emerged it was made of similar material to Grenfell Tower. It was expected to be removed within days, but authorities now say it won't be taken down until at least November. Plymouth Community Homes says additional safety precautions are in place to ensure its residents' safety. Chloe Brewster, 22, fled her flat in the Mount Wise Tower estate with her baby after a fire broke out in one of the blocks earlier this year. "It's absolutely horrifying to think that it's going to be at least to the end of the year that they're going to remove the cladding," she said. "There is a highly likely chance of a fire happening between now and the end of the year. "At the end of the day they're not the ones that are having nightmares about burning to death with a baby in a tower block." Plymouth Community Homes said it would not follow Camden Council's decision to evacuate residents, because the Mount Wise towers have additional fires safety measures and precautions in place. CEO John Clark said last week that the cladding would be removed "over the next couple of days". But in a letter to residents on Tuesday the housing authority said specialist consultants had identified a target date for the removal of the panels by the end of November. Labour MP Luke Pollard has also claimed that some people living in high-rise flats are being refused insurance renewals.